US scientists have drawn up plans to build the largest telescope ever seen. Its 30-metre-diameter mirror would be almost 10 times as big as those in the Keck telescopes in Hawaii, currently the world's largest observatories. The Gordon and Betty Moore Foundation is funding a $17.5m feasibility study and it could be ready for work by 2012. Astronomers say the new telescope would allow a more detailed look at distant stars and galaxies, and aid the search for planets beyond our Solar System. The optical and infrared telescope would be built with adaptive optics, which will flex in a controlled manner to compensate for the way the Earth's turbulent atmosphere distorts the light reaching the planet's surface. The system would result in images more than 12 times sharper than those from the Hubble Space Telescope. The new observatory will also have nine times the light-gathering ability of one of the 10-metre Keck twin telescopes, which are operated by the California Institute of Technology (Caltech), the University of California at Berkeley, and the US space agency. "Constructing and operating a telescope of this size will be a huge undertaking requiring a large collaborative effort," says Richard Ellis, director of optical observatories at Caltech. "The major goals of the design phase will include an extensive review and optimisation of the telescope design, addressing areas of risk, for example by early testing of key components, and staffing a project office in Pasadena." Using such a large and powerful telescope, astrophysicists will be able to study the formation of galaxies at the dawn of the cosmos, as well as the processes which lead to young planetary systems around nearby stars. "The key new capabilities promised by the Thirty Meter Telescope will include a huge collecting area for studying the faintest sources, which are often the most important to understand," says Chuck Steidel, Caltech professor of astronomy. Following the design study, the final phase of the project, not yet funded, will be the construction of the observatory at a yet undetermined site in Hawaii, Chile, or Mexico. 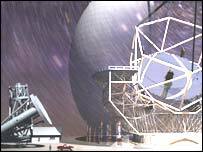 If all goes well, the telescope could see its initial observations - first light - in 2012. Ellis points out that Caltech has a history of building very large optical telescopes. They helped build the Keck twins in Hawaii and before that Caltech's 200-inch Hale Telescope at Palomar Observatory was the largest optical instrument in the world. 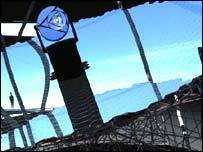 Today, 54 years later it is still in continuous use as a major research telescope. "This project takes Caltech's success in ground-based astronomy to the next level of ambition," Ellis says. 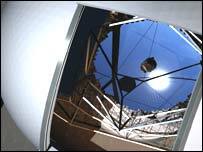 Other projects for huge telescopes are also in the pipeline. There is a European Large Telescope project which plans a facility in South America that would have a mirror measuring 100 metres in diameter.